Lernaea is a genius of maxillopod crustacean which are usually called Anchor worms. They have nine juvenile phases in which they are free living plankton of various forms. Once they are sexually mature they breed. At this point the males simply die off but the females go and find themselves a fish and dig into its flesh. The females body is then modified into a grappling hook shape, or an anchor shape. The body segmentation and most of the organs are lost. 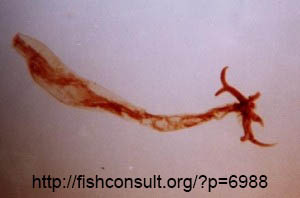 Most of the organism is reduced but a long thin segment can often be seen hanging out of the body of the fish. The female essentially becomes a factory for producing and pumping out fertilized eggs. 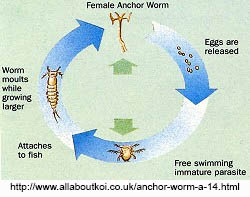 Anchor worms are a common pest in fish tanks and aquaria all over the world. Larnaea can be found all over the world.